Amy Klobuchar is an American former prosecutor, author and politician serving as the senior United States Senator from Minnesota. She is a member of the Minnesota Democratic-Farmer-Labor Party, an affiliate of the Democratic Party, and Minnesota’s first elected female U.S. Senator. 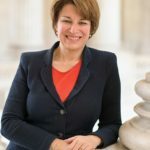 Klobuchar previously served as the county attorney for Hennepin County, Minnesota, the most populous county in Minnesota. As an attorney, she worked with former Vice President Walter Mondale. She has been called a “rising star” in the Democratic Party. "I believe we can incentivize more affordable health care in general by better regulating insurance and creating meaningful competition for health care services." "Who would know but ten years ago that kids would be texting each other all the time, that that would be one of their main forms of communication. And so many times, these kids know more about the technology than their parents. And so many times, we’re putting kids in very adult situations and expecting them to behave like they’re 40 years old." "So many times, these kids know more about the technology than their parents. And so many times, we’re putting kids in very adult situations and expecting them to behave like they’re 40 years old. Well, that’s just not going to happen." "I don’t think it should be a surprise when we’re talking about energy and trying to have more home-grown energy, be less reliant on foreign oil when you look at our health care that we’re trying to get more affordable health care, that these are going to create major debates in this country and be somewhat polarizing." "Well, it is so difficult right now when you look out on the road and how fast people go and the more and more cars you see out there, for teenagers, you’d think a kid that literally, a few years before, was sitting back in a car seat in the back seat is now behind the wheel." "My dad was a sports writer when I was younger and then he became just a general columnist. But I grew up with him literally getting into brawls with football coaches." "I would prefer a public option that would be a competitive option that would allow people to buy into a Federal Employee Health Benefits Program, which is a series of private plans."